There are more than 25,000 species of crustacean. Some are a few millimeters long, while others can have an arm-span of more than one meter. The copepods are the smallest and are mostly seen swimming around your torch when night diving. The isopods, at least the parasitic ones, are often seen attached around the heads of various fish. The most commonly known group is the decapods (ten-footed). This group includes the most common crustaceans, like shrimps, crabs and lobsters. The head and thorax of a decapod are joined together and covered with a shell called carapace, which contains most of the animal’s organs. At the front of the carapace are a pair of stalked eyes, antennae and appendages near the mouth, called maxillipeds (jaw feet). Their first two or three pairs of legs end in claws and are called chelipeds (claw feet). Behind the carapace is the segmented abdomen, more noticeable with shrimps and lobsters than with crabs. Shrimps can be found in many different environments, from open water to shallow coastal waters. Some shrimps live on anemones, others on or between corals, rocks or sand. A few of the small species live together with echinoderms, like urchins, sea stars, crinoids and sea cucumbers. Some live alone, others in groups. Most shrimps are encountered during night dives. Often hundreds of small shrimp come and swim in front of the divers’ torches. 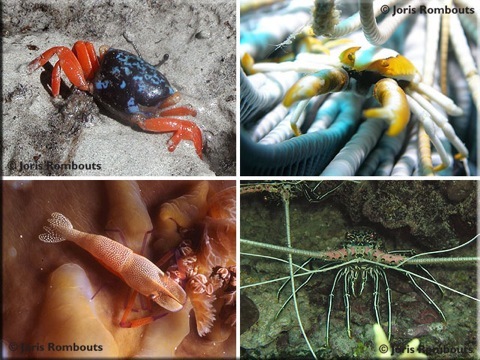 Except for squat-lobsters, most lobsters look a bit like oversized and armored shrimp. Some have more obvious claws than others. They live in crevices, underneath corals or rocks, and the smaller species, on crinoids and sponge. The beetle-looking slipper lobsters are nocturnal and seldom seen during the day. Hermit crabs only have an armored shell in front. Their abdomen is soft and unprotected. They don't grow a protection in the back like other crustaceans, so live in uninhabited shells or artificial substitutes like plastic caps. Some species attach small anemones on their housing for protection. True crabs come in varying sizes, from the size of a pea to the cold water living giants. They are probably the most advanced of the decapods. Crabs have small antennae and retractable eyes, which can be pulled back under the protection of the carapace. Their ten legs are divided into four pairs of walking legs and one set with claws. The walking legs of swimming crabs are much thinner but wider than that of their walking family members. Their abdomen which is much smaller than the shrimps and lobsters, is turned back underneath the shell. They are fast, well armored and camouflaged. Despite their hard shells, most crabs live hidden somewhere in sand, mud or between corals or rocks. Some coral-crabs use parts of sponge or look-alikes which they hold on their back for camouflage. Most coral crabs are nocturnal. Male crabs shed their shell just before the mating season. After the females shed their shells their new shell is still soft and the males are able to insert their modified appendages into her genital opening and pass sperm to her. He then continues to protect her until her new shell is completely hardened. Later, as the female releases her eggs, they are fertilized by the sperm she has stored.